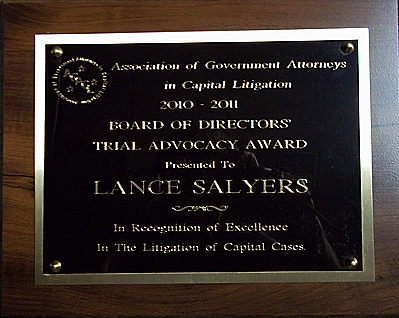 With great pride, I am pleased to announce that Assistant Prosecuting Attorney Lance Salyers has received the Board of Directors’ Trial Award for Outstanding Advocacy in Capital Cases 2010/2011 from the Association of Government Attorneys in Capital Litigation. This award will be presented on Wednesday, July 27, 2011 during the “Best of the Best” Presentation at the 32nd Annual Summer Conference of the Association of Government Attorneys in Capital Litigation held at the Westin, New Orleans Canal Place Hotel, New Orleans, LA. The citizens of Butler County should also take great pride in knowing that the Butler County Prosecutor’s Office by this award has received national recognition with a team member among the best of the best regarding trials of the worst crimes imaginable.